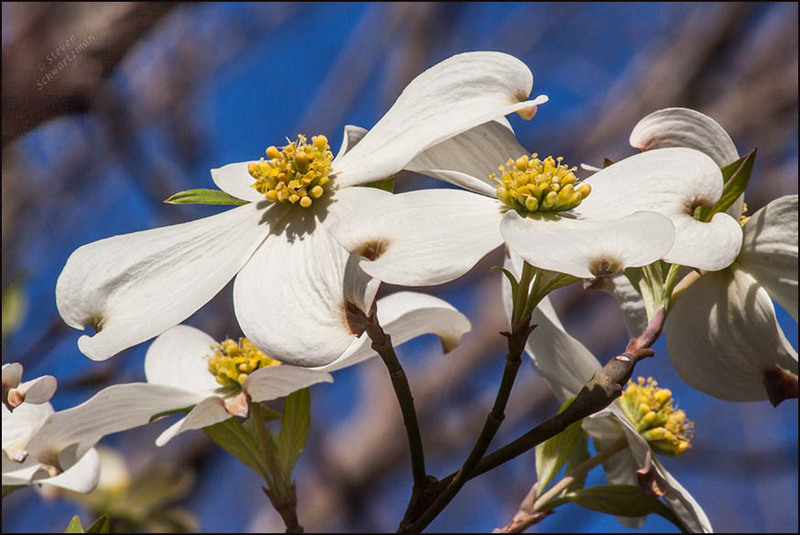 Ten years ago today I photographed these blossoms on a dogwood tree (Cornus florida) near the little town of Warren in far east Texas. I love the blossom of dogwood trees and these look fantastic! I didn’t realize how many species there are around the world, and how many even in the United States. The species shown here isn’t native in Austin but begins to be found one county to the east and is quite common in east Texas. I really like this photo. A neighbor has one, and I’ve planted one although I think it will be a few years before I see blooms on it. When we drove through North Carolina they were in bloom everywhere, up the hillsides along the roads. Like you, I’m pleased with this photo. As you found in North Carolina, dogwoods are a big thing in the Old South, which extends through east Texas. For good reason. They are such a striking tree, from their lateral branching to their spectacular flowers. So the branches grow literally laterally? Thanks. We had a good trip 10 years ago visiting native plant friends from Austin who have a family place in far east Texas. Dogwoods aren’t supposed to grow wild, or easily, in Dallas. But we have some special dogwoods hidden away, now in an Audubon sanctuary in south Dallas County. Come on up and get some pictures of these guys! We have a couple of these, one white and one pink, and it is always a delight when they blossom each Spring. This is a nice reminder. I was surprised when I looked at the distribution map for this species of dogwood to find that it grows on Long Island, where I grew up, and even further north, as you mentioned. In fact it’s in every county in Massachusetts. I remember dogwood trees when we lived in Indian, Steve, and they looked and smelled so lovely. Some people might manage to get them through a Colorado winter, but I have never seen one here. To my surprise, the distribution map shows the species making it as far north as Maine and Ontario, so apparently the tree can take frigid winters. As you say, though, the natural range doesn’t extend as far west as Colorado. There might be some dogwood trees in some botanical garden, Steve, but I am sure it would need added protection from the elements. I sometimes wish I had added protection from the elements, especially the many prickly ones in Texas. 🌵🌵🌵 (I know your variety is much wider, but these are the only ones I could find). That’s just the right word. I first saw dogwood in Mississippi, but since then I’ve glimpsed them as close to me as Livingston. I suspect if I make it over toward the Big Thicket or Sandylands this spring, I’ll see plenty of them there. I’d better hurry, though — I discovered yesteday that spring has sprung with enthusiasm. The petals in your photo remind me of our big, white magnolia blossoms. They seem to have that same “soft stiffness” to them: not exactly waxy, but not fluttery, either. As you saw, I posted this on the tenth anniversary of my visit to far east Texas. Seasons vary from year to year, but on average now seems to be a peak time for dogwoods there. I’d like to see spring there again too, but it’s a longish trip from Austin. You have the advantage of starting so much further east. I see the similarity to the magnolia, another delight of east Texas that you could enjoy at the same time. Is Cornus florida the native species?! I was not clear on that. There were dogwoods growing wild along with the persimmons around Oklahoma City. I identified much of what grew wild there, but did not identify the dogwood. Nor did I dig any up to bring back. The species name refers to flowering, not to the state of Florida (which of course was named for its flowers). Oh, yes, I got that. These are lovely! We have seven of them here, but I don’t know the variety. Yes, you’re in their natural range. I had to travel hours into east Texas to see any at home.